What a wonderful Monday! I have about a million things spinning in my head, and I can’t wait to share all of them with you! I had a glorious weekend – and am glad this week is up and running! Here are a smattering of new things – and wish you all the most lovely Monday imaginable :). 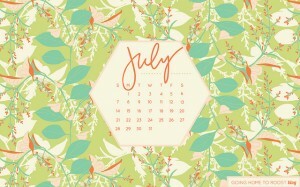 I love the first day of a month – because I get new pretty backgrounds from Going Home to Roost. This month does not disappoint! Get yours here! Today is July 1. Not a big deal – unless you use Google Reader to keep track of all your blog reads. If you are one those loyal readers, you must know by now that today ends Google Reader’s run…and your list of blog favorites will not longer be supported. If you are in this quandary – I totally recommend Bloglovin’ as a excellent alternative. Please check it out and consider following A Modern Commonplace on Bloglovin’. You don’t have to be a blogger to use Bloglovin’! It is an excellent way to store your favorite blogs and only read the latest articles. I used to have a long list of blogs that I daily checked for new articles – exhausting! Save yourself some time and make a list here. You won’t regret it. Here is a handy guide to using Bloglovin – including importing your Google Reader lists. Tomorrow is the last day to enter “Our Favorite Beauty Products” Giveaway! Make sure you stop by, read the awesome beauty tips, and enter!